The Times Higher Education World Reputation Rankings 2017 are based on the world’s largest invitation-only opinion survey of leading academics. It asks scholars to name no more than 15 universities that they believe are the best for research and teaching, based on their own experience. The result is a list of the top 100 most powerful global university brands as judged by those best-placed to know the most about excellence in higher education. Leading universities in Asia are now considered more prestigious among top academics than many distinguished Western institutions, according to the Times Higher Education World Reputation Rankings 2017. China is one of the standout performers: Tsinghua University enters the top 15 for the first time, jumping four places to 14th, while Peking University makes its debut in the top 20, climbing four places to 17th. They overtake leading universities in the US and the UK including Imperial College London, the University of Pennsylvania and Cornell University. Meanwhile, the University of Hong Kong features in the top 40 for the first time in five years after climbing six places to 39th, ahead of King’s College London, the University of British Columbia and LMU Munich. 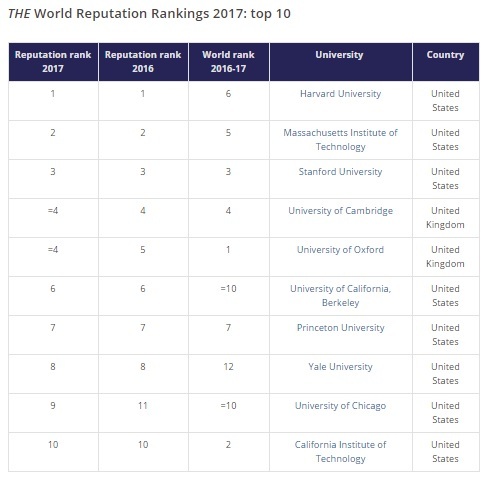 Elsewhere in Asia, the University of Tokyo now has a stronger reputation than Columbia University, according to the table, while Seoul National University is considered more prestigious than the University of California, Davis. Top universities in Belgium, France and the Netherlands have also lost ground as universities in Asia have become more prominent brands on the global stage. The World Reputation Rankings are based on an invitation-only opinion survey of senior, published academics, who were asked to name no more than 15 universities that they believe are the best for research and teaching in their field, based on their own experience.